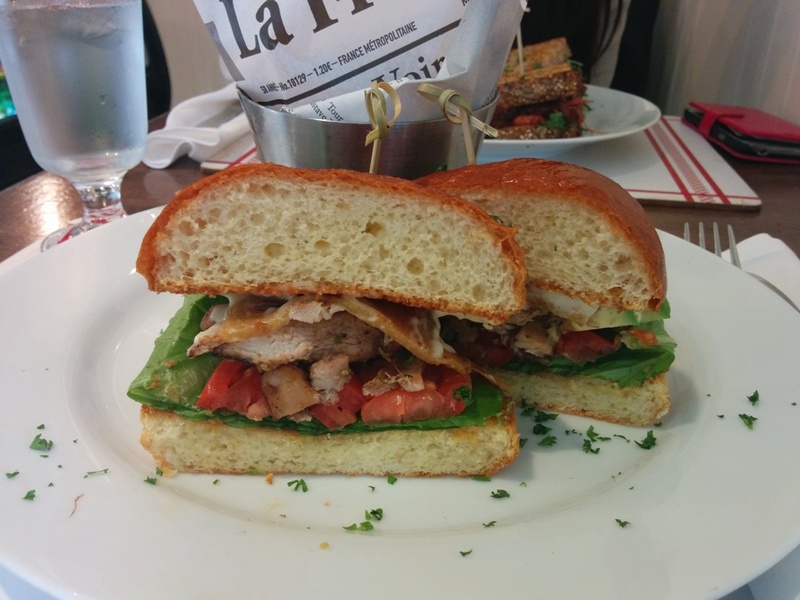 We explored their menu online before showing up and we saw The Jerk which sounded interesting. The online menu never mentioned that it was a sandwich though and also didn’t say that it came with fries or salad so we were pleasantly surprised. The sandwich consisted of roasted jerk chicken, grilled pineapples, avocado and guava chutney with a house made aioli sauce. I believe I’ve only had jerk chicken once before and that was at the Caribbean Festival and it was more heavily seasoned and grilled. This roasted version was almost on the dry side. There were bursts of sweetness from the grilled pineapple that helped keep the flavour interesting though. The bun was soft but unremarkable. I don’t know my bread but it might’ve been brioche? Anyway, I wouldn’t really recommend this sandwich and I was expecting a bit more from it. On the other hand, this came with some amazing Fries!!! I forgot what the description was but it was something like parmesan and truffle or something… So crisp on the outside and fluffy on the inside and deliciously seasoned! These were some of the best fries I’ve had in a while and I couldn’t stop munching on them. I didn’t even need the ketchup and it sure beats a salad right? This was the Braisin’ which was braised short ribs with parmesan cheese, lettuce, pickled red onions, tomatoes and arugula. 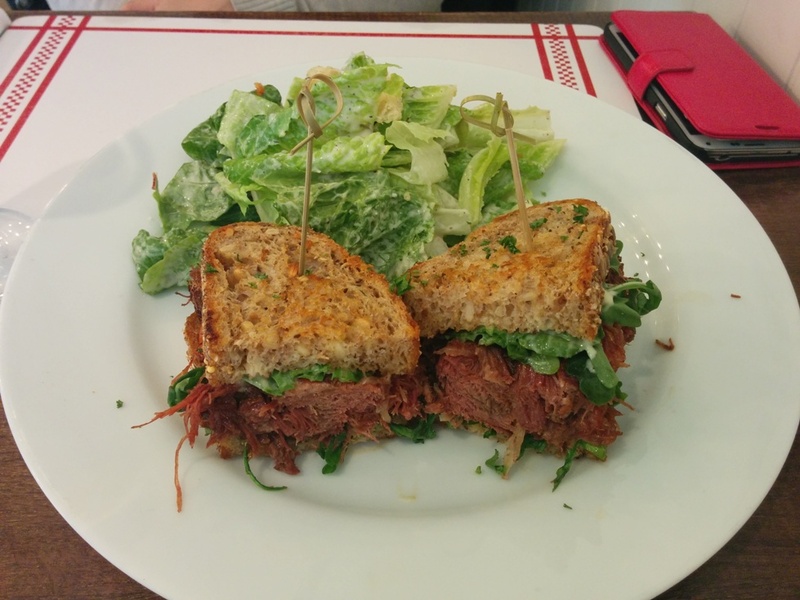 There was a lot of short ribs stuffed into this sandwich! I liked this a lot more than The Jerk! The meat was juicy and shredded quite finely although it became a bit messier to eat. The side of Caesar salad was standard and dressed to my liking. Thyme to Indulge is closed on Mondays and Tuesdays and open 9am-4pm Wednesday-Sunday. 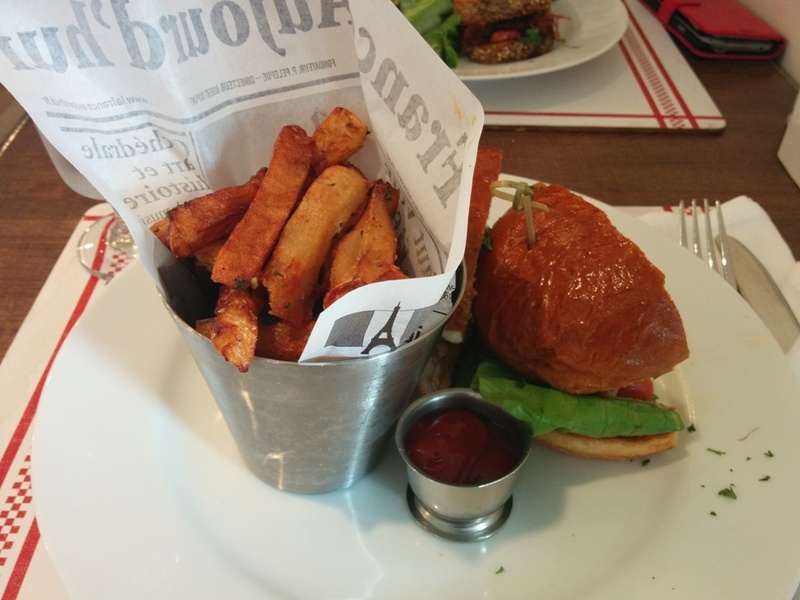 This entry was posted in American/Burgers, Food Reviews and tagged burgers, caesar salad, fries, jerk chicken, short ribs.